The WoW Legion Expansion is supposed to have Metal support. It comes out September 2016. Cool. That sounds good. I'm going to start playing casually again soon and let my guild mates know I'm still alive. Don't do it. You should play ESO instead. MetalVK will not be free though, developers will have to pay for it. Plenty paid transgaming for Cider and this can't be any worse than that turd wrapper. We've got nowhere to go but UP! Oh, I will be but that's for Xbox. I am saving myself for that because it will be more special that way. Boy, ain't that the truth about the hard cider. Oh, yeah. As Jim once sang, "bottom looks like up to me." FWIW it plays real well on OS X. The rare OS X game that doesn't require me to set 480p resolution and low textures. I still want to save myself. I'd imagine any toon started in OS X will be living in a different world than any toon I start later on Xbox. You should not have told me that. I have a weakness for MMOs. If I buy this and get hooked on the OS X version I might never buy the Xbox and that would be all because of you. I hope you will think about that next time. 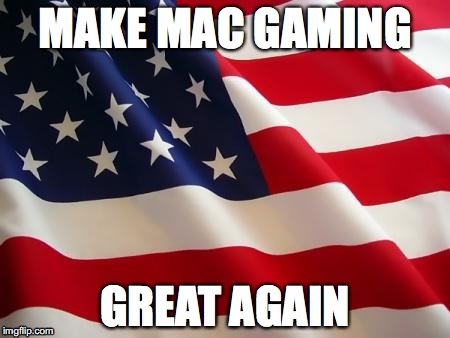 Let's make Mac gaming great again! Might go all in back to mac/console when my windows box dies/ gets outdated enough. Got too much popsnizzle in the house. I might blow away bootcamp in a desperate attempt to restore some sanity around here. I keep thinking, it's not even about Windows or whatever. It's just about what I have time for. Since I have a lot of great games for Mac I keep asking myself, why don't you just give up? You can't do it. There is just not enough time. Just be a Mac user, simplify your life and enjoy your console when you get it. Even that gives me so much stuff to play it's ridiculous. Moments later... I think I'll reboot and upgrade to Windows 10. That'll be cool. Plus, I want to play all my Windows games and be done with Windows. Yeah, I should do that. Some time later... boy, this is a pain in the rear. Another evening spent installing all kinds of stuff instead of playing a game or doing something else that is fun. When will I ever learn? Late that same night... I guess I'll just crash and let Windows keep updating itself and rebooting and updating itself I guess. I'm tired. Next morning over coffee. I guess I should install a few dozen games to play in Windows. This way I can be sure to play all these while my entire investment in Mac games becomes obsolete with the next release or two of OS X. This is a good idea. I wonder what I should play first. I know, how about Ultima III because I want to play all the old games i missed over the years. There's no point in playing something that released this year when I could be reveling in yesteryear's amazing games. A short time later... I don't feel like doing this. I think I'll go see what's happening on CNN, IMG, etc. Maybe I will play a game later. I think I just might trash it. I can install it again sometime if I want. The Steam and GOG Windows games I own aren't going anywhere. I waste too much time thinking about this stuff and screwing around instead of just firing up a game and having fun. What I should probably do is forget about all things Windows and if at some point I run out of Mac and console games to play, well lucky me has a bunch in reserve and those ones have a lot better shelf life than my OS X ones do. popsnizzle ultima iii I had a port of that. Lairware, are they still around. Yep, I chose a bad example because actually Lairware is still around and the guy keeps it updated. It runs just fine on El Capitan. I was messing with it the other day. Best version of Ultima III in existence, bar none. The thing is, if I had half a brain I'd be playing something like Pillars of Eternity instead which would be right up my alley. I love stuff like that. I haven't even played my Enhanced BG, BGII and Icewind Dale games yet and I loved Baldur's Gate. Honest, I am so damned crazy sometimes. The GFXBench suite is now available in a Metal version, so it's possible to make comparisons with the OpenGL version. Interestingly, the OpenGL 3.0 equivalent test (T-Rex) gains much more than the OpenGL 4.x equivalent one (Manhattan). I'll have to run that here to see what the results look like on this particular system. I suppose it would be interesting to run this with the standard driver vs the Nvidia web driver. It is interesting that under Metal the 4000 and 650M are neck and neck on T-Rex (impressive?) but under OpenGL the 650 bests the 4000 by a significant margin. Also the 650M OpenGL numbers are regaldamdissapointing all-around. Is this indicative of how bad the Nvidia drivers are for OS X? I mean I would expect more than a 3fps gain with the 650M over the 4000 on the Manhattan test. Not sure this whets my appetite for some actual Metal supported games.